With the Formula 1 season back underway, we analyse how the success of a car brand in the championship can impact upon wider perception of the brand and even sales of regular road cars. Last year’s championship culminated in a last race shoot-out between two Mercedes drivers, Lewis Hamilton and Nico Rosberg. The Englishman won the race to secure his second world title. Along the way the team broke a number of records throughout the season and were essentially peerless in its duration. They are expected to be as successful again this campaign. The Mercedes name was therefore synonymous with speed and engineering excellence. But did this have an effect on perception of the overall brand? YouGov BrandIndex data illuminates how this success in the sporting realm helped to alter perception of the overall Mercedes brand. If we look at Mercedes’ Buzz Metric rating (whether a respondent has heard anything positive or negative about a brand in the last two weeks) in late November (the time of the championship culmination) we can see they achieved a score which is higher than anything which has followed in the intervening months (+6). If we look at those who specify that they are motorsport fans, we see that the score reached a high of +12. 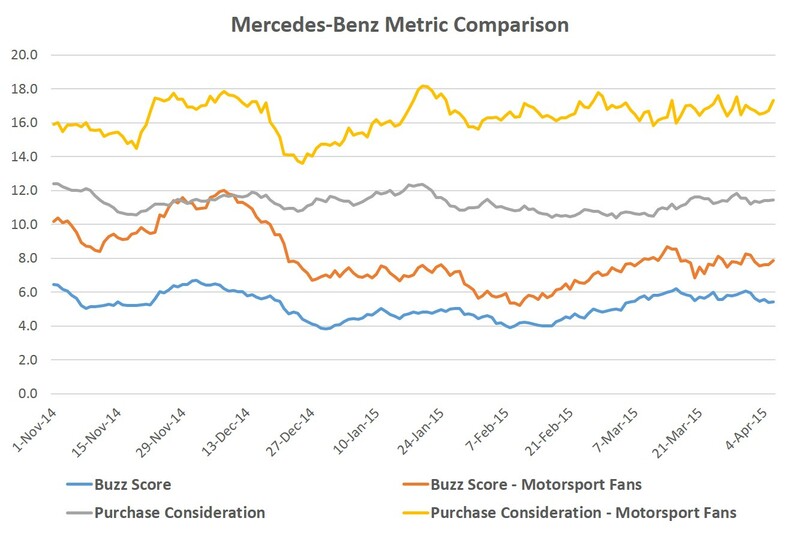 Crucially, we learn that Mercedes’ Purchase Consideration metric was also at a high level around the same time that its buzz metric reached its pinnacle. At the end of November, among all respondents the score was +11 and +14 among motorsport fans. There is already signs this year’s campaign is having an effect, with the score currently +17 among followers of the sport. YouGov Profiler also points towards more opportunities for the brand. It reveals that those who drive Mercedes-Benz cars have motorsports as one of their niche interests. Of course, Mercedes have an extremely strong brand on a worldwide scale regardless of their F1 success. However, our data points to the fact that their increased coverage and attention will help to garner more interest in the Mercedes brand more generally, and even help to make some more likely to consider buying one of their cars. If their success continues on the track as is expected, Mercedes will be looking to capitalise on this off the track. What the other manufacturers can do to fight this remains to be seen.